It’s Friday. I’d say TGIF if this really were my Friday but, working from home doesn’t really give one a true Friday. Friday in our house, as you have probably read in the past if you’ve been following this infant blog, is story hour at the local public library. I honestly think I look forward to it as much as the Daughter because reading is one of my most favorite things and my heart is so happy when my daughter shows her own love for a well-told story. The library story hour started off with two great stories. This story was great. The repetition and addition of new sights and sounds made the kids all enjoy it that much more. The little old lady does have some courage and in the end, the kids know that there is nothing to really be afraid of if we see it in a new light. I have to say though, the scary pumpkin head…not so scary looking. I personally thought it was kind of friendly looking. “We’re going on a Ghost Hunt. We’re going on a Ghost Hunt. I’m not afraid! I’m not afraid!…” This is like that old song we played in Girl Scouts, except instead of the bear hunt/lion hunt, we were on the search for a ghost on Halloween night while we were trick-or-treating. I say we because after we read the story at story hour, the kids picked up some instruments and went on a ghost hunt, crashing cymbals, shaking maracas, and banging drums in the hopes of scaring the ghost out of the library. Instead, the candy ghost left them all a lollipop and they were quite thrilled with their find. We had borrowed this book a few months ago and it’s a sweet story of three friends who live in a house by the ocean. Once night a stranger washes ashore and tries to sell them something they don’t really need. As the three friends drift apart because of the promise of something better, they discover what they truly are looking for and what they truly need. 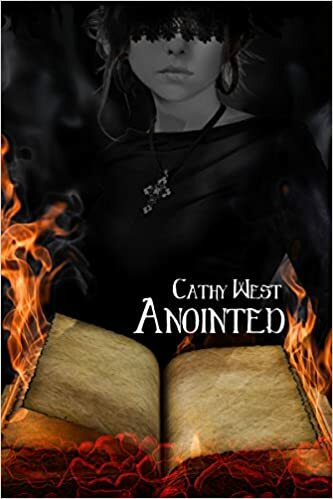 A sweet story of friendship and the dangers of letting others influence your what you know in your heart to be true. A very cute new take on the classic Cinderella. Lots of little giggles through this sweet tale. I picked this up because I was thinking about how the Daughter would eventually start hitting that point in the day where Sassy Molassy takes over my usually sweet and loving child. Sassy Molassy is the Daughter’s alter ego and she does nothing but cry and whine. This book is my (most likely futile) attempt at trying to curtail the whiny Sassy Molassy. This is a very endearing tale though, about a monster who cannot decide how to cook the whiny children recently caught. A funny tale of two friends who decide to have a sleepover. The only problem, as many moms and dads are aware, is that both have very different bedtime rituals. Another fun read for just before bed – the Daughter really enjoyed it! When the grouchy old man in the neighborhood notices that the birds he loves to watch and paint are fighting off a very clever family of squirrels (genius squirrels to be exact), he tries to stop them from stealing all the food. That is until the birds fly south for the winter and he finds himself lonely. Then the squirrels hatch a plan of their own. Even a grumpy old man can appreciate a grand act of kindness. I like to share our reading selections each week because I know there are so many stories out there. Some are instant classics and others kind of quietly sit on a shelf just hoping that someone, sometime will just pick it up and read it. Those books need to get some credit too. Plus, I know I love getting good book recommendations, whether it’s a book for me or one to be shared. Reading is so important and builds so many skills but most importantly, it allows kids to grow their imaginations. If you have a child and that child asks you to read to them, try to make every effort to put down what you’re doing and read that book to them. In the end, that is the memory that will stay with them. 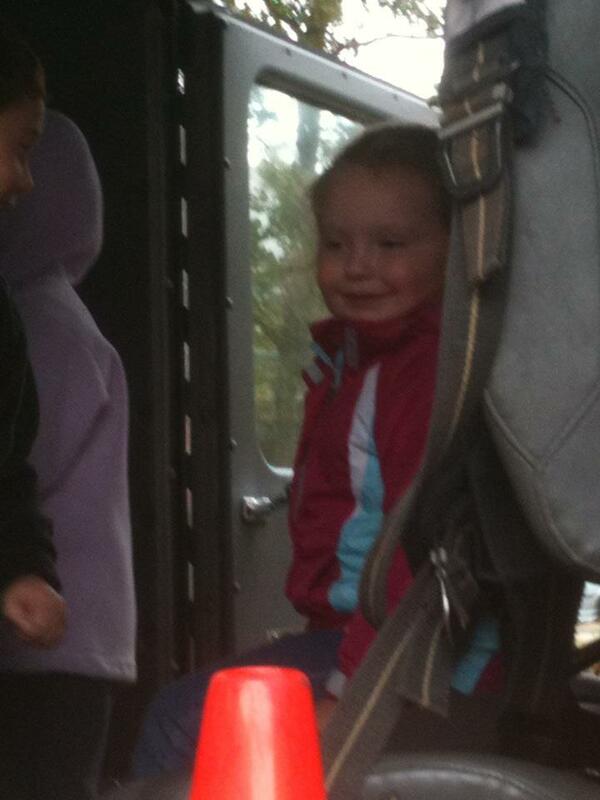 The Daughter in the firetruck…loving every minute of it! The Daughter was more than happy to see all the fire equipment. She thought it was “amazing” and I think that’s good. We recently had begun at home fire safety, reviewing our plan, where we would meet everyone after we got out of the house, and the most important – Stop, Drop, and Roll. After we read two great stories about fire and firefighters, we left equipped with a coloring activity book for the Daughter, as well as a fire safety check-list for the home and a paper fire truck with all kinds of helpful hints. All of this was supplied by FEMA US Fire Administration and I think will be helpful as I keep working with the Daughter on fire safety. And what Friday trip to the library would be complete without our weekly picks for bedtime stories? A sweet story about mermaids who come to the shore to celebrate the solstice moon. They have an amazing party and then dance in the waves and the moonlight of the summer solstice moon. Peter Alan writes a letter to a fish inviting the fish to his house. What happens next, no one could quite be prepared for! A very adorable tale of what happens when you have unexpected house guests! This takes the original nursery rhyme and see what happens after the dish runs away with the spoon, what did the cat with fiddle play, and that cow – why did she jump? A cute rhyme with music in the back. I will attempt to teach it to the Daughter on the keyboard – attempt being the key word. This sweet book builds up a monster and then sends it back away. A fun pick for Halloween time to help the Daughter understand that these things are just make-believe! Have you read any great bed time stories lately? Today was the Pre-School Story hour at the Mashpee Public Library. This is the story hour for the 3+ year old children. It’s by far one of the best story hours we have been too. The Daughter loves it because not only does she get to see some of her friends from pre-school, but also because she is able to hear new stories, sing a song or two, and then make a fun craft to bring home. Today’s stories were fall themed and featured the animal so many of us associate with fall: Squirrels. 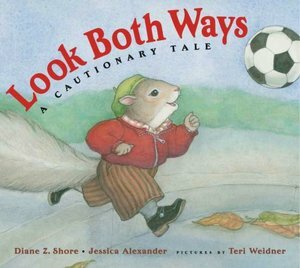 The story was a cute rhyme that told the tale of a little squirrel who, in his haste, did not stop to look both ways. No, he did not meet an untimely and messy demise, but he did learn the importance of stopping before crossing the road. This one was perfect because recently, the Daughter and I have been working on looking both ways and being safe in parking lots. It was a cute little tale that hammered home the message of street safety. Remember folks, when you see a ball roll into the street, there is most likely a child right behind it! 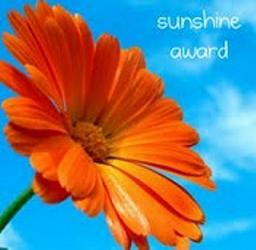 The second story was a great positive tale of how to turn a bad situation into a positive situation. A tale that accentuated the notion that everything happens for a reason. I think when the Daughter gets a little older, we will revisit this one when she can get a better understanding of the underlying message to this one. It was cute, though. 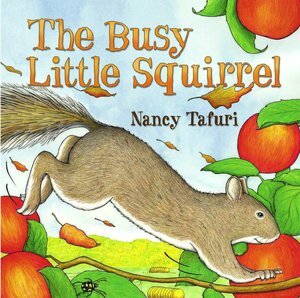 The repetition of why this busy little squirrel could not stop to enjoy the day with all the other animals really got the children engaged. They eagerly waited for the moment to answer and then when it got to the end, they were surprised to find out why the squirrel had been so busy. After the Daughter created her own squirrel with a very bushy tail made out of grass that grows in the salt marsh, we went to find our own books to bring home. After reading all of them tonight for bedtime, I have to say this week was a good selection of books. 1) Skippyjon Jones in Mummy Trouble – We have recently been on a huge Skippyjon Jones kick. We recently took out the first book in this delightful series. 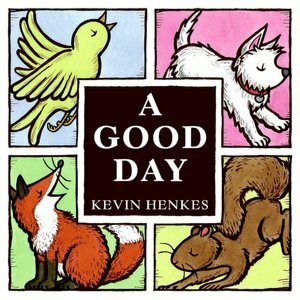 I love reading aloud to my daughter so when this little Siamese kitten decided that he was really a chihuahua, I found the voices for this story to be too much to resist. Poquito Tito is my favorite to be honest. 2) Necks Out for Adventure – The illustrations in this one were the main reason why I picked this book off the shelf. Following the story of Edwin Wigglskin and his thirst for adventure, this tale teaches the importance of not being afraid to be yourself and sticking your neck out there. Though, I don’t know that my daughter will ever eat little neck clams again, let alone go clamming with the family again. 3) And Here’s to You! – A celebration of life and how wonderful the world truly is. A story that definitely ends with a hug and a kiss. 4) Oh No, Gotta Go! – I picked this one because it was bilingual. My sister-in-law is Mexican and all of her family still lives there and when we went last year for the wedding, I realized that maybe I should have taken Spanish instead of 8 years of French. So, every chance I get to expose my daughter to Spanish (we’re going to start with this one), I do. 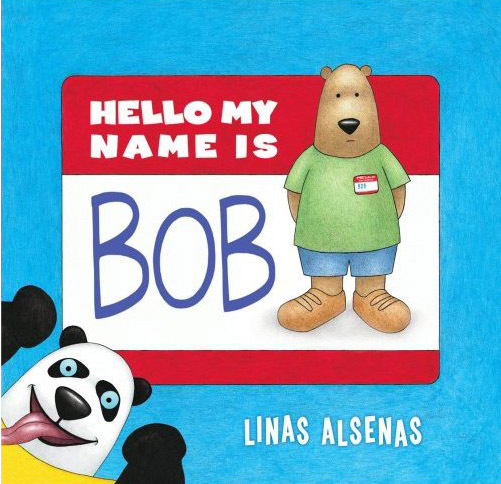 This book was great because it didn’t translate all the words, but rather left them as context clues in the story. The daughter understood all but one word which was good in my opinion! 5) Is Anybody Up? – This was a sweet tale of how even when we feel alone, there are people all over the world who are doing the same thing and are just like us, even if they speak a different language or are in a different place. A sweet story. So, those are the five Library picks for this week. Have you read any of the above books? What did you think? Fall is by far my most favorite season of the year and September is my most favorite month. The skies seem bluer and the air is full of fantastic smells. The cooler nights mean perfect sleeping (even if the ragweed is currently wreaking havoc on everyone’s sinuses in the family) and the early morning dew makes the air seem that much more crisp because it’s visible. Even though technically, by the earth’s rotation, this is the last weekend of Summer, it felt like a proper Fall weekend. It was an action packed weekend too! The Daughter and I were very happy to go back to story hour at the Mashpee Public Library. This is, by far, one of the best story hours I have ever been to. The children’s librarian does an amazing job with the 3+ year olds. Three stories, a couple of little songs and dances, all finished off with a craft. It’s a wonderful story hour. This week, we read stories all about Bears. This was a very cute book. I enjoy it as a mom because it gives me a chance to kind of sit back and relax while the Daughter gets some very important kid time and reading time – it’s a win-win-win. I worry sometimes since she is an only child that she doesn’t always get as much interaction with other kids as she should. Yes she’s in daycare two days a week but I wonder if that’s enough sometimes. Story hour is good because a couple of her friends from daycare go too so she gets to see them and there are other kids as well so she gets to make new friends too. I’m so happy that she loves to read and loves the library. Reading is probably one of the most important skills in my opinion so I’m thrilled that she seems to love it and looks forward to our weekly trip to the library and our nightly bedtime story ritual. Saturday was even more excitement for the Daughter. We surprised her with Disney On Ice – Rockin’ Ever After at the Providence Dunkin’ Donuts Center. 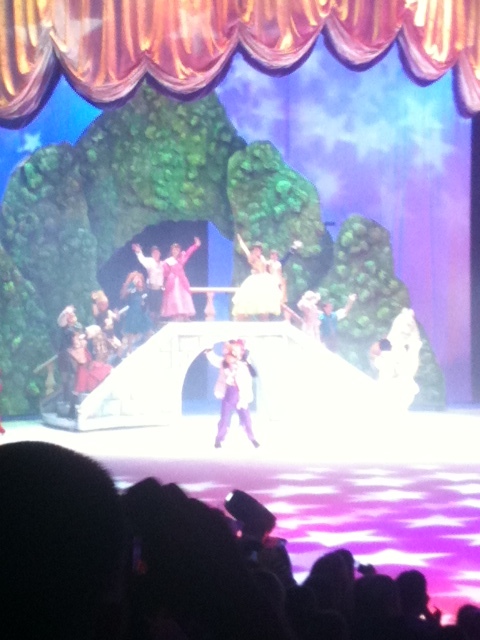 I have very vague memories of my first time ever going to Disney on Ice. I was around the same age as the Daughter and I remember Peter Pan was in the show we saw. It was so much fun to see her face light up when Mickey and Minnie skated out on to the ice. She almost jumped into the rafters and it was amazing! The excitement and the joy at seeing the Mouse and his “gang” as she called them. She was a little sad that Pluto and Daisy weren’t there but after we told her that they must be back at the Clubhouse making sure that Pete wasn’t lonely, she was ok. Then there were the princesses. They were supposed to be the main event, but for the Daughter, they were second fiddle to the mouse. But the fun didn’t stop there! Oh no! Today, we did our annual family trip to Pippin Orchards in Cranston, RI. Every year, we usually will drive out here to go apple picking. Today was the day because one of the Brothers was running a 5K in downtown Providence so it made sense that after we went to the race (which we didn’t exactly make), that we continue on to go apple picking. They said that they had honey crisps ripe. Sadly, the few trees that had the honey crisps had nothing but rotten apples on them. That was sad. Luckily, the Macintosh apples were ripe and ready to be picked. 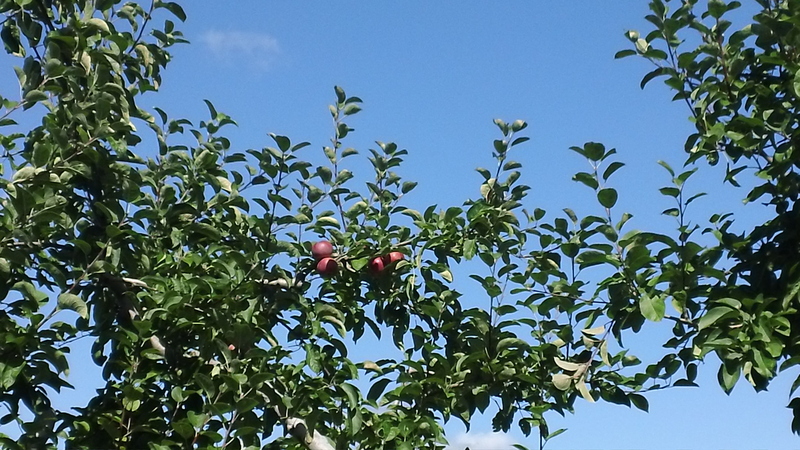 Though, the ripe ones were so high up in the tree, we had to jump to reach them. It was the perfect day to be out and enjoying the day with the family and tasting the delicious, fresh apples. 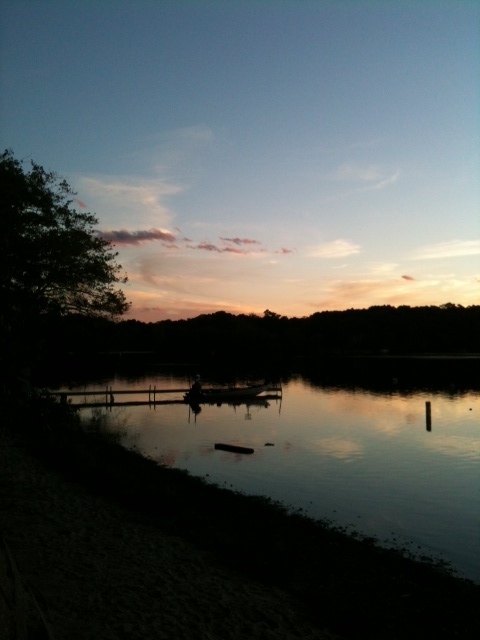 When we got home, we pried the Husband away from football, and the three of us went for a walk down to the lake. It was just after sunset and peaceful. 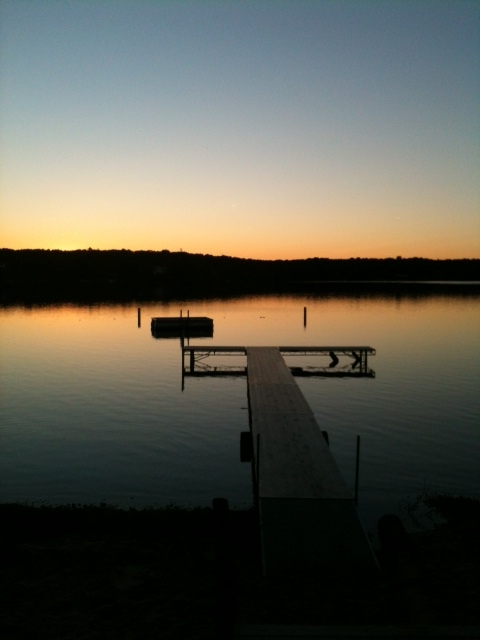 The lake was like glass and the minnows were in the shallow end grabbing their supper, making ripples every few minutes that spread slowly over the smooth surface. The colors of the sunset reflected on the water. 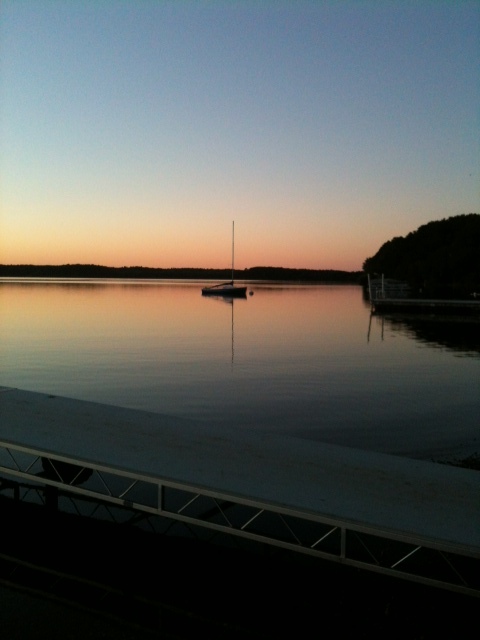 A neighbor’s sailboat on the glassy water. 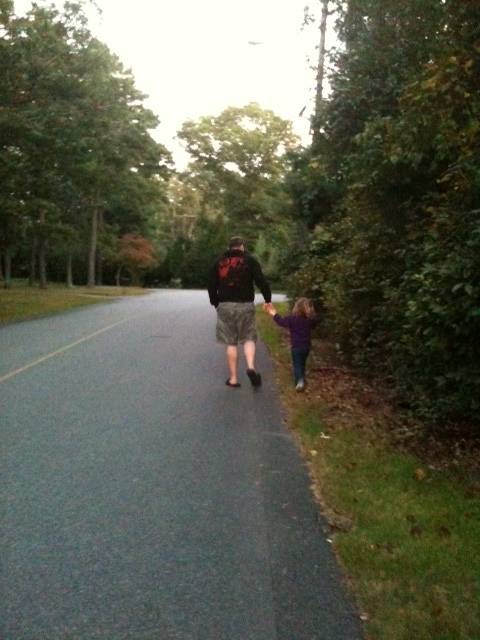 The walk home was shorter than the walk there only because the Daughter was on a mission to get home for a “special treat” for eating her dinner and going for a walk. That pretty much meant racing home the whole way shouting “I’m winning. I’m winning.” But she did end up making some time to hold hands with Daddy and talk about what a wonderful weekend it truly was.